I absolutely love how my R3 is looking with this new integrated tail light! This was a very easy installation thanks to the videos. I am still waiting for the halo flush mounts to come out so I can complete the look on my bike. Thank you to the team at TST! Great design, smooth plug & play installation, incredible price. 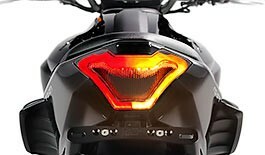 The videos made it easy to do installation and the smoked taillight looks perfect on my black FZ-07. The build quality was top notch as well. Super easy install especially if you watch their install video. It took me about 45 min to install along with their fender eliminator kit and tag light. Advantages: Love the ability to program light patterns. and my wife said it's super bright during peak day, which was a concern of mine. Don't need to get rammed from behind. This thing looks amazing. So much better than the stock lights. The taillight outline really gives it that aggressive look. Got the clear version for my Yamaha Fz-07. It is absolutely amazing. So much brighter and the ability to delete my rear signals is amazing. Love the programability of the brake lights and turn signals. Did I also say this is bright?? Looks awesome too. Advantages: Super Bright, Integrated Signals, LED so much brighter. Amazing product, easy to install! Do not have to be mechanically inclined to install. Disadvantages: None. I can't name one, that's how great this is. Very satisfied with my purchase. My tail end looks so clean and sharp now. Before my purchase, I was concerned that my turn signals will not easily be seen, but not so. The LED intensity is super bright, and it is very visible. The installation was easy.